Video encoding settings are adjustable in 4Easysoft Mac Mod to iPod Converter, you can freely set detailed video and audio parameters to customize the output quality. You can also use this Mod to iPod Converter for Mac to edit videos before converting. Movie trimming, video cropping, picture capturing, effect adjustment, video files merging and more are all available. And with our cool Mod to iPod converter for Mac users, users can add watermarks and subtitles to the videos; also users can select output audio tracks. This cool software also supports batch processing which allows you to output different formats simultaneously. The imported files are perfectly supported, including Mod, Tod, MPG, MPEG, MPEG2, VOB, MPEG2 HD and they could be converted to MPEG-4, H.264/MPEG-4 AVC, MOV, M4V. Mac Mod to iPod software can extract audio from Mod and convert audio files for iPod, supported output audio formats include AAC, MP3, WAV, AIFF, M4A, etc. While playing files, click left square bracket to set the start time and click right square bracket to set the end time during the preview to capture your favorite video and audio clips. To crop your movie video, you can just move your mouse cursor to an adjustment box and drag the crop frame. You can also set the output aspect ratio from the Zoom Mode: Keep Original, Full Screen, 16:9 and 4:3. 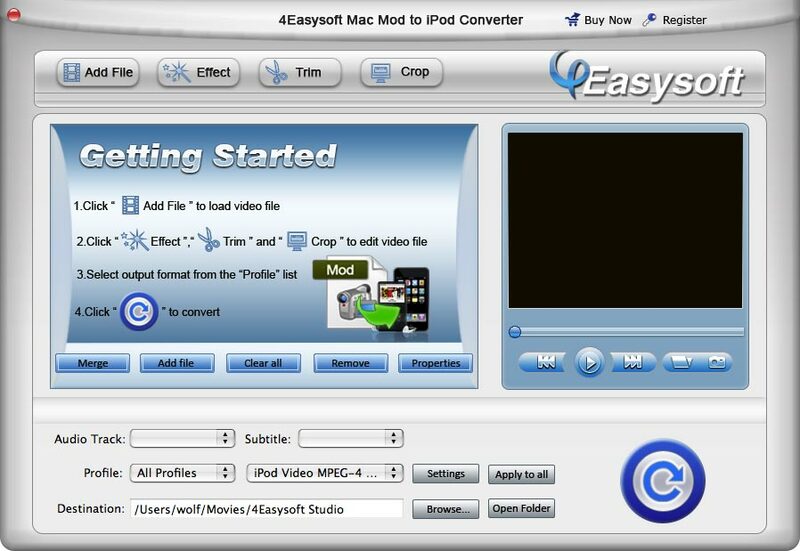 4Easysoft Mac Mod to iPod Converter allows you to set the video Brightness, Contrast, Saturation and audio Volume. Checking Deinterlacing helps you to convert interlaced video to the progressive video to optimize the video effect. You can adjust the encoding settings of output video and audio to get best quality or get smaller file size as you want. Mod to iPod Converter for Mac provides an easy way to combine and join multiple videos together with most video formats supported. Just select the videos you want to join and check the "merge into one file" box you can finish that easily. This program provides video previewing, you can see the after-conversion video effect when you manage it. If you like the current image of the video you can use the "Snapshot" option. Just click the "Snapshot" button the image will be saved in the format of GIF, JPEG, BMP, and you can click the "Open" button next to "Snapshot" button to open your picture.